A winning ticket worth an estimated $540 million ($380 million cash value) for the Friday, July 8, 2016, Mega Millions jackpot was sold in Indiana. In addition to the jackpot winner, there were 10 Match 5 winning tickets sold around the United States. Seven are worth $1 million each – sold in Connecticut, Louisiana, Massachusetts, Maryland, Missouri, New Jersey and Oklahoma. 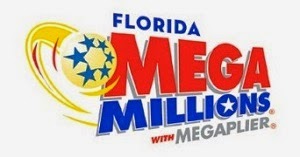 Three included the optional Megaplier, so their tickets are worth $2 million each – sold in Colorado, Florida and Kansas. The interest in tonight's drawing was so huge that the Florida Lottery's website experienced delays and occasional down times. The jackpot has been growing for four months, having last been won on March 8 in Washington. The only other jackpot won this year was on January 8 in New York. MEGA MILLIONS jackpot prizes may be paid in 30 annual installments or a one-time, lump-sum payment that jackpot winners may choose to receive instead of receiving their winnings in annual payments. Winners who want the Cash Option payment must claim their prizes within the first 60 days after the drawing. View the latest winning numbers for all Florida Lottery games here.